456. Cary’s rotary pump. Within the fixed cylinder there is placed a revolving drum, B, attached to an axle, A. Heart-shaped cam, a, surrounding axle, is also fixed. Revolution of drum causes sliding-pistons, c, c, to move in and out in obedience to form of cam. Water enters and is removed from the chamber through ports, L and M; the directions are indicated by arrows. 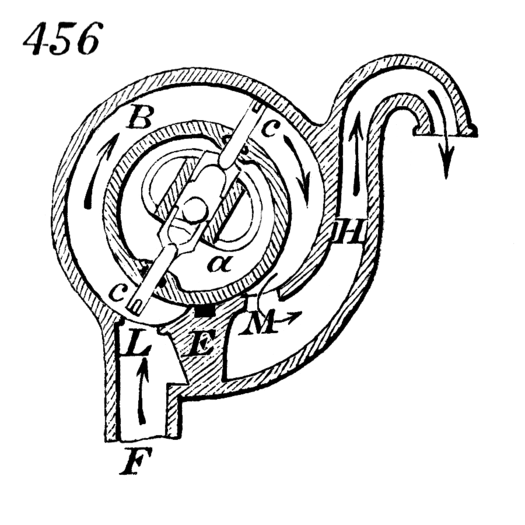 Cam is so placed that each piston is, in succession, forced back to its seat when opposite E, and at same time other piston is forced fully against inner side of chamber, thus driving before it water already there into exit-pipe, H, and drawing after it through suction-pipe, F, the stream of supply.